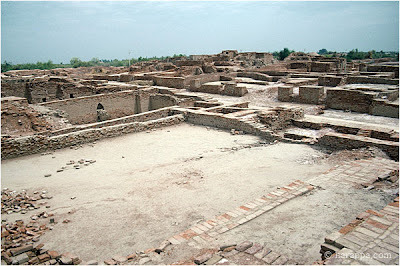 Mohenjo-daro, is an ancient planned city laid out on a grid of streets. 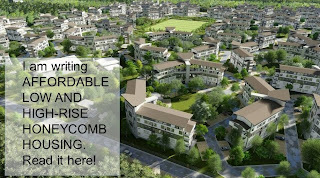 An orthogonal street layout was oriented toward the north-south & east-east directions: the widest streets run north-south, straight through town; secondary streets run east-west, sometimes in a staggered direction. Secondary streets are about half the width of the main streets; smaller alleys are a third to a quarter of the width of the main streets. 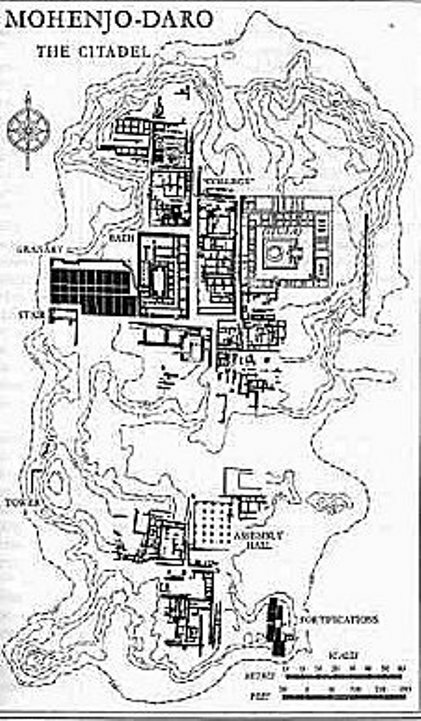 The large platform, called the ‘Citadel’ is presumed to be the administrative seat. Other public buildings are temples and public baths. 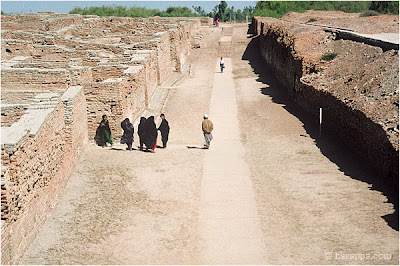 There are also granaries where the stores are elevated above brick platforms that have ventilation ducts. Separated from the domestic areas are the artisan workshops. The street layout shows an understanding of the basic principles of traffic, with rounded corners to allow the turning of carts easily. The drains are covered. The city probably had around 35,000 residents. 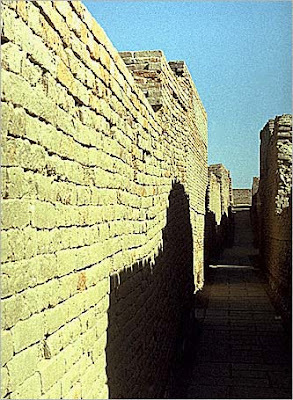 The buildings were constructed of sun dried and burnt bricks. 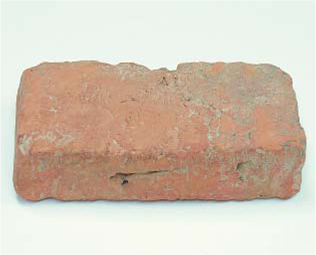 The bricks found in Mohenjo Daro and other Harappan sites are all the same size 7cm x14cm x 28cm. 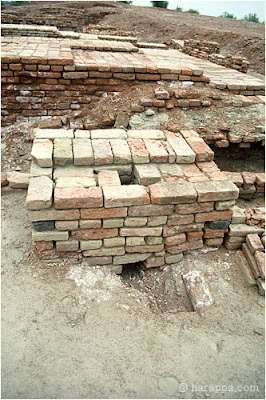 Sun-dried bricks were used for infill, and burnt bricks were used for the drain and sewer linings. The house was planned as a series of rooms opening on to a central courtyard providing an open space inside for community activities. There were no openings toward the main street – only rather small openings to the side streets. . Brick stairways provided access to the upper floors or rooftop gardens. The houses are believed to have flat, timber roofs. Houses built with a perimeter wall and adjacent houses were separated by a narrow space of land. 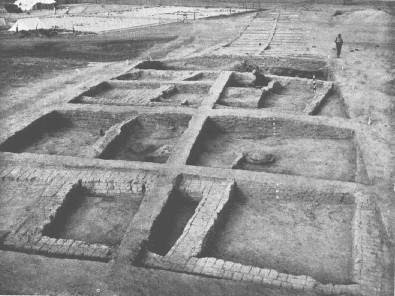 There were just a few fairly standardized layouts, perhaps an indication of a fairly egalitarian society. But not all houses had two stories and only the larger houses have their own wells. There are also rows of single-roomed barracks, perhaps for singles, soldiers or slaves. 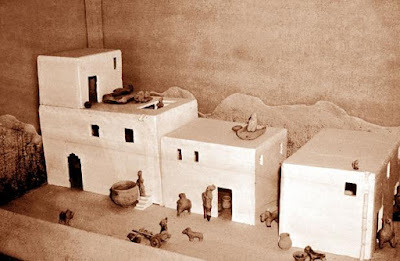 For water, the big houses had their own wells, other wells would serve groups of smaller. 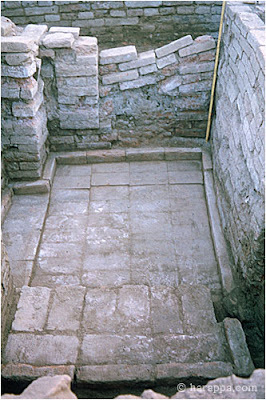 Almost every house had a bathroom, usually a fine sawn burnt brick pavement, often with a surrounding curb. Waste water was directed to covered drains, which lined the major streets. First floor bathrooms also built. 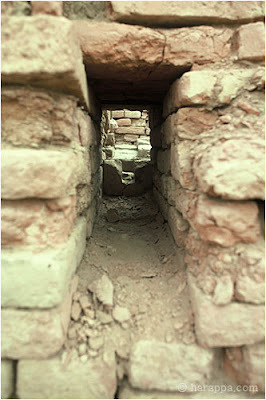 There is also evidence of vertical drains which were probably their toilet. 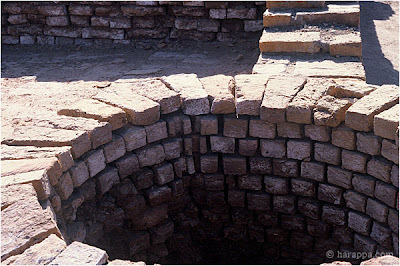 The house drains start from the bathrooms of the houses and join up to the main sewer in the street, which was covered by brick slabs or corbelled brick arches. On the streets we can find manholes for cleaning; some drains flow to closed seeps, others flow out of the city. Note the covered drain on the right hand side of the street! 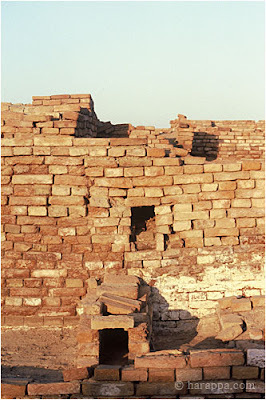 Mohenjo-daro was successively destroyed and rebuilt at least seven times. 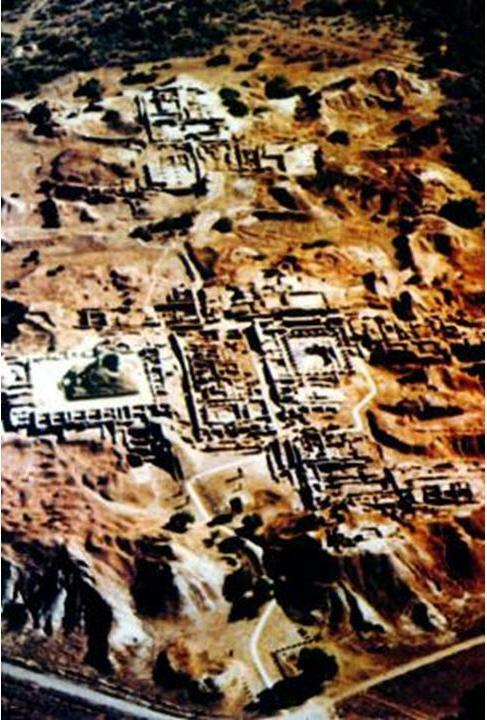 Each time, the new cities were built directly on top of the old ones. 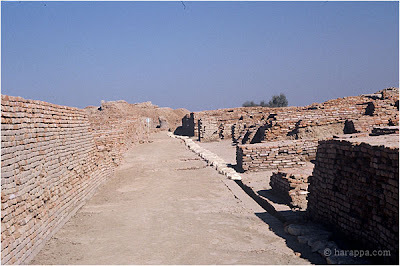 Flooding by the Indus is thought to have been the cause of destruction.